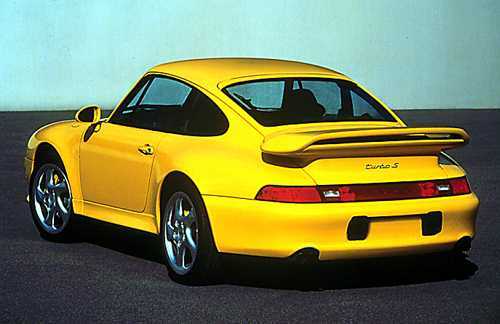 The 1997 911 Turbo is quite a car, but Porsche has gone one better. They are offering the limited edition 911 Turbo S, what will become the #1, top performing, best, utmost, fastest, most outrageous 911 EVER. This, my friends, is the last stand for the 911--what started way back in 1963 ends here--with the epitome--the 1997 911 Turbo S.
Based on the current all-wheel-drive 911 Turbo, the Turbo S is the most exotic and powerful Porsche production car yet offered for sale in North America. Externally, it is distinguished from the Turbo by its unique body work featuring Aerokit II front and rear spoilers, left and right rear side panel air ducts, and additional light-level left and right front air inlets. For enhanced performance, the Turbo's standard 3.6-liter, twin-turbocharged, air-cooled, flat six-cylinder engine has been increased from 400 to 424 horsepower for the Turbo S, the highest power output ever derived from a Porsche production engine sold on this continent. The Turbo S is equipped with a wide variety of other special standard features created exclusively for the model. 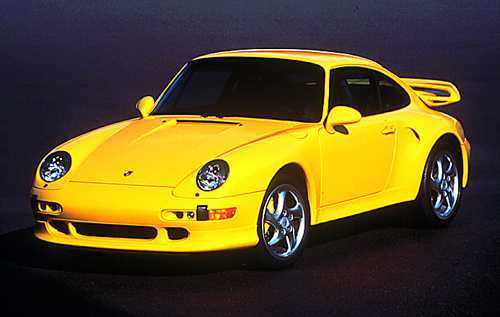 They include carbon fiber instrument cluster, instrument panel, door panel inserts and door pulls, an impressive all-leather interior, unique 18-inch "Technology" polished-look wheels, yellow brake calipers, an additional front oil cooler, three-point color coordinated front seat belts, and distinctive Turbo S script on the rear deck lid, wheel center caps, front trunk and rear seat carpeting, door threshold panels and steering wheel.